Despite his varied musical background, from bluegrass bands to country groups to a pop lounge act to choral ensembles, there’s a folkie somewhere in Steve Spurgin’s head. 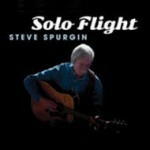 It escapes in Solo Flight, Steve’s third Blue Night Records release. He chose all the songs for this project, from such well-known writers as Norman Blake (“Church Street Blues), Steve Gillette & Tom Campbell (“Darcy Farrow”), Hoyt Axton (“Angelina”), and Hal Ketchum ( ‘I Miss My Mary Tonight”). Characteristically, Steve wrote four of the songs himself, including our favorite: “The Light’s Still on at Trixie’s”. What makes this project especially unique, aside from Steve’s stellar voice, of course, is the way he wanted to do it. Just him, his old faithful guitar, and a couple of microphones. No side men, no background vocalists, no studio tricks. Just Steve Spurgin in your living room. You couldn’t be in better musical company.